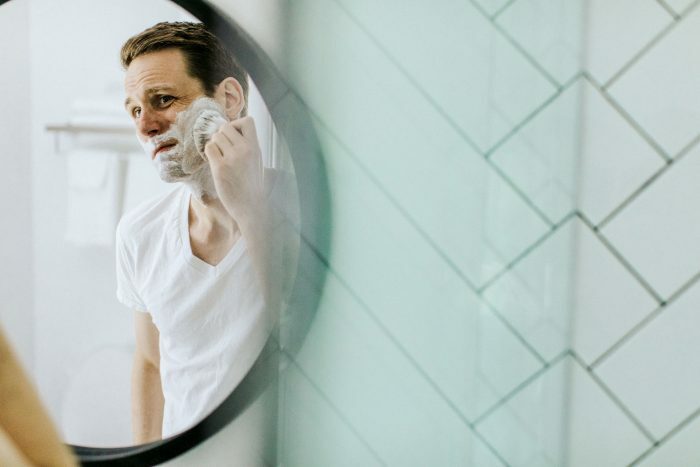 Shaving-related irritation is one of the most popular cosmetic complaints among men. While it can affect any part of the face, the neck area is particularly sensitive to shaving nicks and redness. If you are looking to keep your shave smooth and irritation-free, stick around as we share a few useful tips below. Shaving close to the skin without causing trauma is challenging. Also, shaving can compromise your skin barrier. Specifically, our skin has a layer of lipids that works to retain moisture and regulate the entry of any chemicals. When we shave, this lipid layer is compromised, especially if alcohol-containing aftershaves are used. When the lipid layer is damaged, the skin becomes extremely vulnerable to external stimuli. Moisture is easily lost to the surroundings and foreign chemicals can enter the skin easily. The skin can be more irritable at this stage. Shaving may also be a physical stimulus for the receptors in our skin. While the sensory receptors in the skin are meant to perceive pain, they also react to more innocent environmental stimulus like a razor. Upon shaving, the skin releases mediators that cause a flare response, which leads to redness or a burning sensation. When shaved, the hair is left with a sharp tip. Ingrown hairs happen when the tip grows out of the follicle, curves downwards and re-enters the skin. Alternatively, it can grow inwards and penetrate the deeper skin layers. Your body recognizes the hair’s reentry as a foreign object and triggers an inflammatory reaction that causes redness and itchiness. The follicles can resemble a pimple filled with pus. To avoid this, do not stretch the skin while you shave as it causes newly cut hair to retract underneath the skin. Razor burns occur when there is skin inflammation. Symptoms include burning, itching, stinging and redness. In mild cases, the discomfort can last for a few hours and resemble a rash or scratch. If the condition worsens, you may notice bumps that resemble pimples. Dry beard hair is stiffer more resistant to applied forces, which means stiffer hair requires greater force when shaving. To soften the beard hairs, first, wash your face with warm water and a gentle antibacterial cleanser like Miel Honey™ Cleanser. The cleanser is formulated with natural honey and Arnica Montana that reduces the risk of infection. The motion of washing your face also releases embedded hairs. Shave with the grain, i.e. in the direction of hair growth, to reduce razor burn. Use a sharp and clean razor blade with every shave. Dull blades require more pressure and unclean blades can introduce bacteria and trigger inflammation. If ingrown hairs are a significant issue, switch to electrical razors that reduce the closeness of the shave. Maintain beard hair at length of 0.5 to 1 mm to prevent hair from penetrating the skin. Use a moisturizer after your shave to decrease irritation and rehydrate the skin. An emulsion-based, lightweight moisturizer like Radiance Fluide™ Hydrating Emulsion is recommended. If you experience persistent shaving-related irritation, it is best to visit an accredited dermatologist. A thorough consultation can identify any underlying condition and provide advice on suitable treatment options.